Some multiple choice practice questions on geometric optics were discussed in the posts dated 1st January 2008 and 3rd January 2008. You can access all posts related to geometric optics by clicking on the label ‘geometric optics’ below this post. (e) impossible to be calculated with the given data. Data is certainly sufficient for calculation. A very simple figure showing the formation of the image of the sun is shown. Since the sun is far away from the lens, its real image is formed at the focus of the lens. 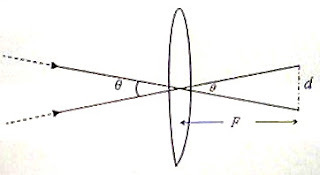 The angle subtended by this image at the optic centre of the lens is θ radian so that the diameter d of the image is Fθ. [The sun subtends an angle of nearly 0.5º on the surface of the earth. If you use a convex lens of focal length 1 m, the diameter of the image will be Fθ = 1×(0.5×π/180), remembering that 180º = π radian. The diameter of the image will be nearly 0.0087 m = 0.87 cm]. The length as well as the breadth will be magnified 20 times. In other words, the areal magnification is 20×20 = 400. Since the area of the slide is 12 cm2, the area of the image will be 12×400 = 4800 cm2 = 0.48 m2. n = dreal /dapp where n is the refractive index of the medium in which the object is placed. The refractive index n is with respect to the medium from which the object is viewed. 1.5 = dreal /6 from which dreal = 9 cm. Since the real distance of the air bubble from one face is 9 cm, the real distance from the opposite face is (12–9) cm = 3 cm. 1.5 = 3/x from which x = 2 cm [Option (e)]. 1/F = 1/f1 + 1/f2 + 1/f3 where F is the combined focal length and f1, f2 and f3 are the individual focal lengths. In the present case, f1 = f2 = 40 cm and f3 = 10 cm. This gives F = 6.67 cm, nearly. 1/F = 1/40 + 1/40 + 1/∞ since the focal length of a plane mirror is infinity. Therefore, F = 20 cm].